Other Common Names: Beebread, cow clover, meadow clover, purple clover, trefoil, wild clover, Wiesenklee (German), trébol (Spanish), rauðsmari (Icelandic), rödklöver (Swedish), triolet (French). Habitat: Red clover grows commonly in the wild throughout Europe, Asia, and Africa and has been naturalized to North America. It is used as a grazing food for cattle and as a green manure as is a nitrogen-rich crop. Description: Red clover is a perennial plant and a member of the Leguminosae or Fabaceae family also know as the legume, pea, or bean family. 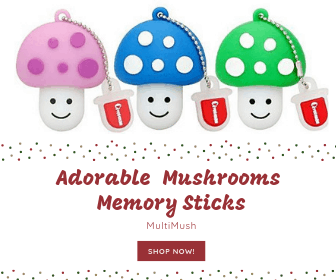 It can grow to approximately 1-2 feet and has purple-pink or pink tubular flowers. Its name is derived from Latin: “tres” for three and “folium” for leaf and “pratense” for growing in meadows. Red clover grows mainly on cultivated land and is considered quite valuable as it improves the soil by binding nitrogen from the atmosphere. Plant Parts Used: It is the flower heads that are used in herbal medicine. The flower heads are collected when the plant starts to flower during the summer months and dried for later use in the making of capsules, tinctures and herbal teas. More than 125 chemical compounds have been identified in red clover plant. The most important substance are flavonoids, isoflavones, coumarins, resins, phenolic acids (such as salicylic acid), essential oil, sitosterol, starch, and fatty acids. The isoflavones (formonnectin, biochanin A, daidzin and genistein) found in leaves and flowers have an estrogen-like effect. In addition, the plant contains many essential vitamins and minerals like calcium, chromium, niacin, phosphorous, potassium, thiamine, magnesium, and vitamin C.
Red clover has been used traditionally in the form of an ointment to treat skin problems like rashes, acne, psoriasis and eczema, often in combination with plants like yellow dock (Rumex crispus) and dandelion (Taraxacum officinalis). 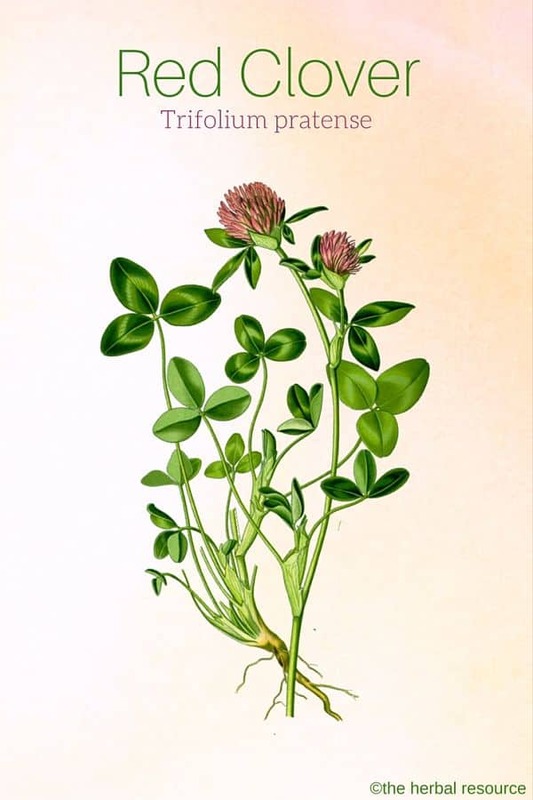 Due to this traditional use red clover has become a popular ingredient in many commercial skin products. It is also used, often combined with yarrow (Achillea millefolium), as a facial toner and to treat itching caused by insect bites and stings. Red clover has a reputation as a medicinal herb in relieving many menopausal symptoms. It has especially been used to reduce hot flashes and night sweats during menopause, an effect that is most likely due to certain flavonoids found in the herb. These flavonoids are estrogen-mimicking substances known as phytoestrogens that may contribute to maintaining normal estrogen levels during menopause. Even though red clover can maintain estrogen levels at their optimal it can also be used to reduce high estrogens levels. This is because the phytoestrogens are weaker in their nature than estrogens produced by the body, and both bind to the estrogen receptors. So if the estrogen production is high, the weaker phytoestrogen may reduce those high levels of estrogen. Due to this ability, the herb has gained much interest in recent years as a possible breast cancer treatment. It seems that red clover has the ability to strengthen the blood vessels by maintaining arterial elasticity. A study from the year 1999 indicates that the herb has the same positive effect on women’s circulatory system during menopause as soybean (Glycine max) and even hormone therapy. 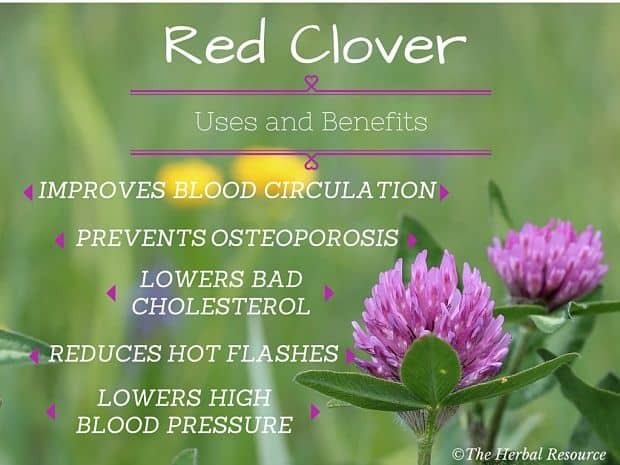 Red clover extracts have also been shown to have a positive effect on high blood pressure. It is also suggested that the herb may be of use for women experiencing breast pain and menstrual cramps. Red clover has antispasmodic and expectorant properties which could make it useful as a treatment for a cough, bronchitis, and whooping cough. It has also been used as a treatment for the common cold, asthma, and tuberculosis. 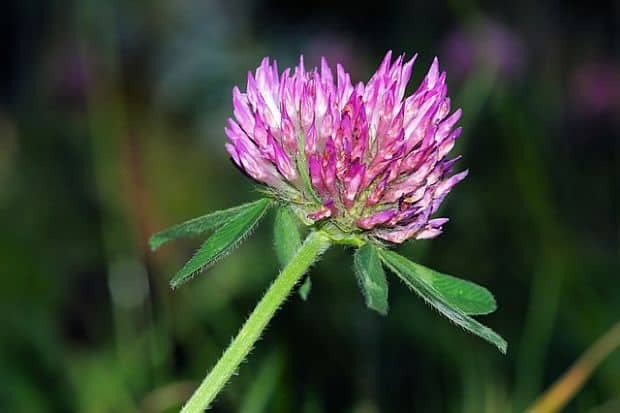 Red clover has a long history of traditional use in China, Europe and Russia for a variety of medical conditions including bronchial asthma, liver and digestive ailments, sore eyes and burns. There are promising evidence indicating a positive role for red clover in the development of osteoporosis. As estrogen levels drop during menopause, the risk of developing osteoporosis increases. A few studies exist that have shown that the isoflavones present in the herbs may slow down bone loss and even increase bone mineral density in menopausal women. But as these studies have been preliminary more research is needed to firmly confirm this use. Because red clover has been used traditionally as an alternative cancer therapy, researchers have now studied the isoflavones present in the herbs to find out if they could play any part in eliminating and fighting cancer. Some preliminary studies suggest that the herb may have some cancer-fighting properties, probably due to the isoflavones estrogen-like effect. Additional studies are needed to investigate if the herb could be truly utilized as an alternative and natural cancer treatment in the future. Both the flower heads and the leaves of red clover can be eaten fresh and used in salads. The flower heads have a rather sweet and agreeable taste. They can also be added to soups or stews. In the time of famine in the past, the flowers were used in porridge and bread making. The flowers are well suited for tea making, either on their own or in combination with other herbs. As herbal tea: Use one or two heaped teaspoons of the dried herb in a cup of boiling water, steep for at least 10 minutes and then strain if needed. The usual therapeutic dosage is 3 to 4 cups a day. Red clover tincture: Use one teaspoons of tincture. 2 or 3 times daily. For commercial made tinctures the manufacture’s instruction should be followed. Red clover compress: – prepare a strong batch of red clover tea and while it is still hot/warm soak a cotton cloth, clean linen or a cloth in it. Side effects with red clover are generally mild and rare. They include breast tenderness, menstruation changes, and weight gain. Red clover extracts have theoretically been associated with interactions with blood thinning agents e.g. warfarin and some hormonal therapies but this has not been confirmed with actual case reports but the herb does contain coumarin that can convert to dicumarol when the herb is dried. Dicumarol is a known blood thinner so using the dried herb along with pharmaceutical anticoagulants should be avoided. Red clover should for the same reason also be avoided before and after surgical operations. Although there is no evidence for concern, it is advised that red clover extracts should be avoided in women with a history of breast cancer. Pregnant and breastfeeding women should not take red clover. Women on birth control pills or other hormonal therapies should consult a professional healthcare provider before using the herb. People who are allergic to peanuts (Arachis hypogaea) should in all likelihood avoid red clover as these two plants are related. Foster, Steven: 101 medicinal herbs. Loveland, Interweave Press. 1998. Mindell, Earl: Earl Mindell’s Herb Bible. New York, Simon & Schuster / Fireside 1992. Tillotson, Alan Keith: The One Earth Herbal Sourcebook. New York, Twin Streams 2001.